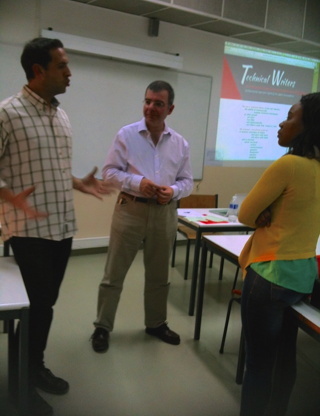 After the class at FCSH on April 22nd, professor Rute Costa praised the event to her colleagues. Some students did not attend the first class because of scheduling conflicts, so Rute asked us to go back for a second class. We set a new date. Unfortunately, Rui Diogo Serra could not return on May 20th due to professional conflicts. The room was nicely filled with 15 students from the masters of Writing and Text Edition, plus the professors Clara Nunes Correia and Antónia Coutinho. Although they went to the trouble of requesting a larger room to leave space for outsiders, we had a single outsider. Joaquim Baptista started by explaining the major difficulties and evolution of technical writing in Altitude Software between 1997 and 2014, including details of the hiring and coaching processes. Then, he explained all the different tasks that a technical writer can do, actually a summary of the tasks he did during his work at Altitude Software. This vision forms the basis for his new consulting business. Daniel Bofill explains technical writing. Daniel Bofill explained the complexity of SISCOG products, especially their customization. He added details of the project to systematize all documentation, which was approved one month ago. He stressed that he was presenting the problems at SISCOG, and that he is still searching for the solutions. Answering to a question, Daniel Bofill explained his view that technical writing is about the technique of writing, instead of writing about technical stuff. Nine persons returned their public reports, mostly filled with curiosity and kind words. There was some initial misconception in class that “Technical Writers @ Lisbon” was a comercial enterprise, and that misconception was only dismissed near the end of class. Some of the comments reflect that initial confusion. I would like to thank professors Rute Costa, Clara Nunes Correia, Antónia Coutinho, and all the attendees for their attention and their questions. We certainly felt welcome. Wednesday, 20 May, between 18h00 and 21h00 (be sharp). FCSH (Faculdade de Ciências Sociais e Humanas), tower B, floor 3, room T16. Avenida de Berna, 26 — 1069-061 Lisboa. Joaquim will revisit his 17 years of experience at Altitude Software, and then he will explain the skills that an experienced technical writer brings to the market. Joaquim presented his work at Altitude Software on June-2013, and updated the presentation on May-2014, while the second part of the talk was first presented on April-2015. Daniel will present the complexity inherent to the documentation of the flexible SISCOG products. Daniel has been working on a business case to manage all SISCOG content centrally. Daniel presented his work at SISCOG on October-2013, and updated the presentation on May-2014 and April-2015. The participation is free, but subject to room capacity. Feel free to extend this invitation to friends and other interested parties. More interesting participants will improve the learning experience for everyone. This particular session will be spoken in Portuguese, although the slides remain in English. Thanks to our sponsors for all the support: CLUNL (room), APCOMTEC (marketing), EuroSIGDOC. And special thanks to Prof. Rute Costa and Prof. Clara Nunes Correia for welcoming this event. PS: Unfortunately, Rui Diogo Serra was busy at this date. I will compensate by extending my presentation with my published experience at Altitude Software. PPS: Don’t forget our joint full-day event on 23-May at ISCTE with ISTAR-IUL, APCOMTEC, and EuroSIGDOC: http://pxquim.com/blog/2015-05-23-twl-iscte.html. PPPS: Yes, we will have TWO formal events in the same week! Report of the meeting, including the slides of the presentations. 19 pages.